IS TECHNOLOGY HOLDING YOUR TEEN BACK? Have you noticed the way kids are constantly staring at their cell phones? They spend more time looking at that little screen than engaging with each other, face to face. The technology created to enhance personal communication is actually blocking it. Social skills are the top factor in getting a job, according to Harvard University. Is your teen prepared? Smile & Succeed for Teens is an attention-grabbing crash course in SOCIAL and JOB skills that helps teens get better grades, develop meaningful relationships with parents and peers, and find (or even create) a fulfilling career. For middle- and high-school-aged kids, 12+. • What colleges are looking for in applicants, and a lot more. ​THINK YOUR TEEN WON'T READ SMILE & SMILE FOR TEENS? And because the Bureau of Labor Statistics says teens may read for pleasure as little as six minutes per day, Direct, concise with no wasted words, Smile & Succeed for Teens is structured to be read in small doses. It was written with teen reading habits and preferences in mind. Teens Are Reading—and Loving—“Smile & Succeed for Teens”! Why? Because they helped write it! As any parent or teacher will tell you, in order to get through to a teenager, you have to grab—and hold—their attention. Smile & Succeed for Teens was written with the help of teens to make sure it would capture their interest, and keep them reading. A quick overview of Smile & Succeed for Teens presented by the author, Kirt Manecke. · not yet clear on a career path. 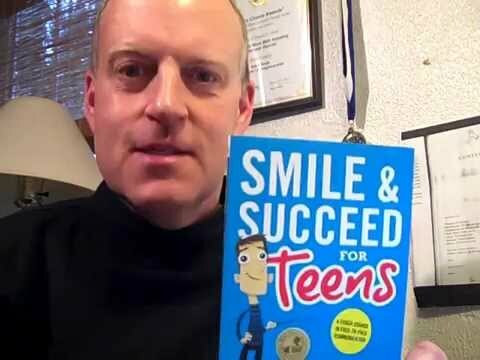 Smile & Succeed for Teens can be read cover to cover, but it also serves as an effective quick-reference guide for kids with an ultra-short attention span. Teens can use the book like a dictionary or encyclopedia, finding the topic they need help with in the Table of Contents, and going directly to that section of the book. Teens won't only walk away with information. They will walk away with a step-by-step process for applying what they’ve learned. You are fully protected by our 100% No-Risk Double-Guarantee. If you don’t like Smile & Succeed for Teens over the next 14 days, then we will happily refund 100% of your money. Learn about the Classroom Packs. FREE PDF Teaching Guide with your purchase of a classroom pack(s). The audio book for Smile & Succeed for Teens is available on Amazon Audible. 1% of the sales of Smile & Succeed for Teens is donated to animal welfare. Smile & Succeed for Teens is printed on FSC certified paper.